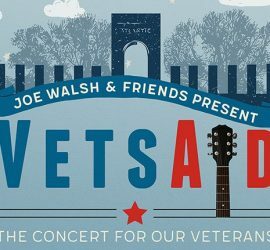 JT will join Joe Walsh, Don Henley, Chris Stapleton, and HAIM for the VetsAid 2018 veterans’ benefit concert on November 11 in Tacoma, Washington. See the Tour page for ticket information and an article at People.com offers more details about the line-up. 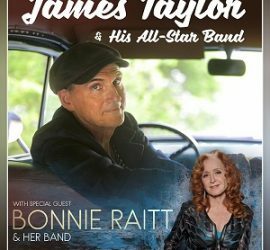 JT’s summer tour with special guest Bonnie Raitt begins on May 8 in Jacksonville, Florida before heading across the country and then across the pond to the U.K., Ireland, and Italy. Update: Due to a medical issue Bonnie Raitt won’t join the tour until June 22. See the Tour page for all the details including ticket information. JT has added a July 17 concert in Cardiff, UK featuring special guest Bonnie Raitt and her band. Fan pre-sale tickets are available starting March 5. See the Tour page for all the details including fan pre-sale ticket information. JT has announced six concerts in the U.K. and Italy featuring special guest Bonnie Raitt and her band. Fan pre-sale tickets are available for all the shows. JT and Raitt will also perform at two Paul Simon concerts in London and Dublin. See the Tour page for all the details including fan pre-sale ticket information. 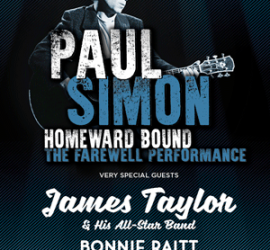 JT and Bonnie Raitt will be special guests at Paul Simon’s “Homeward Bound: The Farewell Performance” concert in London on July 15. See the Tour page for all the details including fan pre-sale ticket information.